When you no longer need a shared OneNote 2016 notebook on OneDrive, there’s an important decision you need to make. Do you want to delete the notebook for good? Or do you want to keep the notebook, but not have it on OneDrive anymore? If you don’t want your notebook to appear on OneDrive, and you don’t want to save any of your notes, you can delete your notebook. Caution: Deleting your notebook is permanent. Make sure you really want to delete it and that you’ve copied any information you’d like to keep. Note: If the notebook you want to delete is on your computer, not in the cloud, see Delete a notebook from your computer. Open OneDrive and find the notebook in your list of documents. Place the pointer over the tile and check the box that appears. Return to OneNote and click the name of the notebook you just deleted from OneDrive. Right-click the notebook, and choose Close This Notebook. 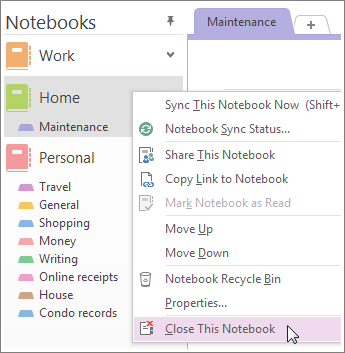 Important: Closing the deleted notebook in your list of notebooks is important or else OneNote will try to sync with a notebook that no longer exists and you’ll get a syncing error. If you want to keep the content from your notebook, but don’t want it to appear on OneDrive anymore, you can move it to your computer. A notebook can't be moved wholesale to a new location. 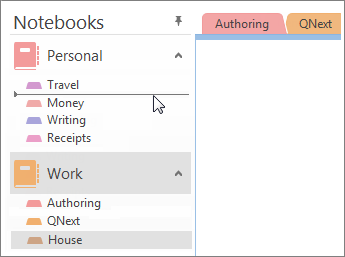 You can move its contents section by section by first creating a new notebook on your computer. Then you can move the content to the new notebook and delete the old notebook from OneDrive. Note: Moving a notebook to your computer has disadvantages. You won't be able to get to your notes on any of your other devices. If you'd like to take full advantage of OneNote, but you don't want anyone else to look at your notes, consider keeping the notebook on OneDrive. You don't have to share it with anyone other than yourself, but you'll be able to open your notebook on your smartphone, tablet, or on the web. If others already have access to your notebook, you can stop sharing it anytime or change who can view or edit it. In OneNote, choose File > New > Computer. Give your new notebook a name, and choose Create Notebook. 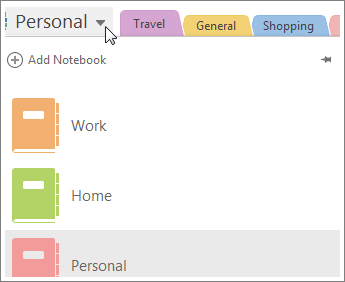 Click the arrow next to the name of the notebook so you can see all of your notebooks. Click the pushpin icon to pin the Notebook pane. Now that all your notebooks are visible, drag each section from the notebook you want to delete to the notebook you just created.